Restoring nearly 11,000 burned acres of prairie, fence, trees and hayground to its original condition is not possible. 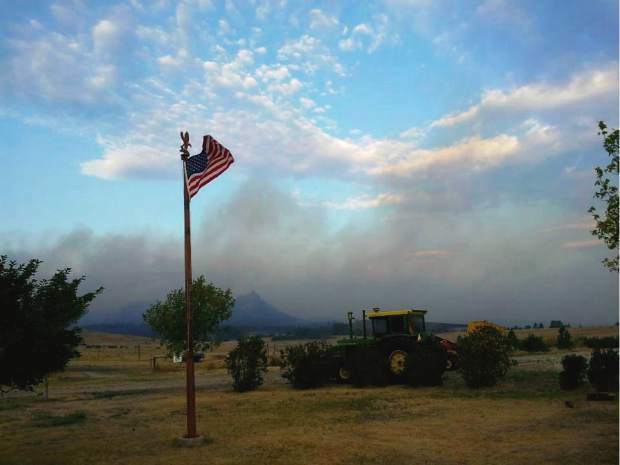 But ranchers in Perkins County, South Dakota, affected by the Pautre fire are trying to do just that. The Pautre fire was a prescribed burn started by the U.S. Forest Service that quickly burned out of control and blackened both private and federal land in April of 2013. Those ranchers learned Friday, June 27, 2015, that the federal government will not take responsibility for the fire or associated expenses. "Our review of the claim discloses no liability on the part of the United States. Therefore your FTCA (Federal Tort Claims Act) claim is denied," said an assistant with the office of general counsel under the United States Department of Agriculture to the claimants, in individual letters received last week. The letter to the grazing district, which filed for almost $2.5 million in damages, does not indicate that the value of the claim is a factor in the denial. 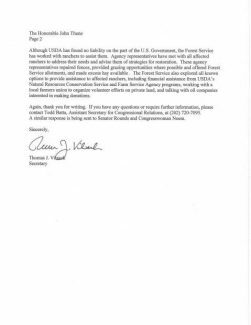 U.S. Department of Agriculture Secretary Vilsack sent a letter to Senator Thune (R-S.D.) to inform him of their denial. 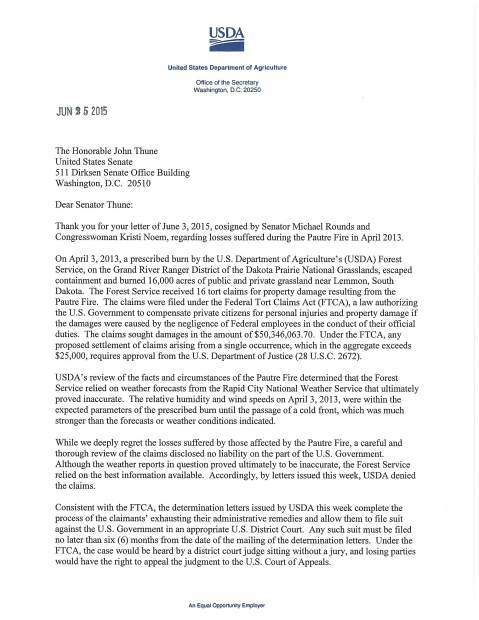 "While we deeply regret the losses suffered by those affected by the Pautre Fire, a careful and thorough review of the claims disclosed no liability on the part of the U.S. Government. Although the weather reports in question proved ultimately to be inaccurate, the Forest Service relied on the best information available. Accordingly, by letters issued this week, USDA denied the claims," Vilsack said in the letter to Thune. It is estimated that about half of the land affected was private with the balance being USFS land that lies within the Grand River Grazing District and is leased by the grazing association for summer livestock range for local rancher permittees. While spending their days building fence, moving cattle to any available pasture and selling cattle when grass couldn't be found, ranchers were completing paperwork to estimate their expenses in the months following the prescribed burn intended to cover just 130 acres. In the days and weeks following the fire, restoration was on the minds of even the forest service employees. "We'll cover what damage there is," Dennis Neitzke, Dakota Prairie Grasslands supervisor, was quoted in the April 4, 2013 Bismarck Tribune. "We got lucky. There were no homes burned." Babete Anderson, USFS public affairs representative said that she had learned of USDA's decision through online news sources last week. "The USDA has found no liability on the part of the government. The forest service has neither the ability to settle tort claims or the authority to accept responsibity." Of the approximately 25 miles of fence destroyed, the USFS "cobbled up" about one half-mile, under a previously scheduled repair project, said Grand River Grazing Association member Tim Smith, from Lodgepole, who was serving as the grazing group's president at the time of the fire. That is about the extent of the help offered by the USFS, Smith said. "Basically what they did, they had meetings." Smith disputes claims in the Vilsack letter to Thune that credits the USFS provided "grazing opportunities where possible… made excess hay available… explored options… including financial assistance through Natural Resources Conservation District…talking with oil companies interested in making donations." According to Smith, the only pasture made available was state land, not USFS land, ranchers did not qualify for the EQIP program through NRCS, and "no oil companies made donations," he said. Smith recalls then-USFS ranger Paul Hancock saying at a public meeting in Hettinger, North Dakota, about five days following the fire "The forest service is liable and responsible. We will do whatever it takes to make you whole again." Those same words appeared on a poster in the room the day of the meeting. 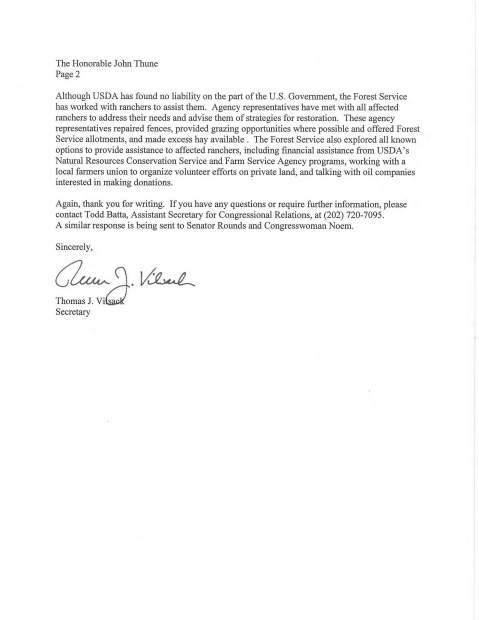 Nearly a year later, about six weeks after Senators Heitkamp (D-N.D.) and Hoeven (R-N.D.) publicly called the USFS "negligent," Hancock was transferred to a different office, said Smith. Anyone desiring reimbursement due to government negligence must follow the tort claim process, said Frank Carroll, a Custer, South Dakota forestry consultant. "For example, in 2000 the Park Service allowed a big wildfire to get out of control. It burned 200 houses in Los Alomos, New Mexico. The government rebuilt every house at government expense." The process is a tedious one. But it was the only recourse ranchers had, Carroll said. The retired USFS strategic planner, who has worked in the wildfire division with the government agency for 43 years, has plenty of experience with the effects of fire. Because of his expertise, Carroll was called in to help the 16 claimants, including the Grand River Grazing District and 15 ranchers, develop draft claim documents. Affected ranchers utilized the expertise of Carroll and his partner in determining the value of lost fences, grass, etc. "Our claims were substantiated, not pie in the sky claims," said Smith. "We brought in people to say how much it would cost to replace fence. We were categorical and exact," he said. Smith's private property was not affected by the fire and he, personally, did not file a claim, but he helped complete the paperwork for the grazing district's almost $2.5 million claim. Originally the 16 claimants reported $10 million total in losses, but the claim was amended after filing and eventually climbed to about $50 million. Most of the original claims, including the grazing district's, remained unchanged, Smith believes. One rancher whose private property and leased federal grazing land was burned is frustrated with the entire situation. "This is just one of many cases where a controlled burn on federal land got out of control." Vince Gunn, Shadehill, South Dakota cited similar cases as far away as Florida. He said about four and one-half miles of his private fence burned, along with grass he had been saving in case of a disaster. "It was mostly dry grass. It was like a torch the way it went. It burned really hot and burned the wires." Gunn pointed out that wire can withstand a few seconds of fire, but when a hot grassfire moves through, engulfing the fence for an extended period of time, the wire is basically ruined. "They say the fence was old anyway; it isn't their responsibility to fix." But when charred pasture starts to green up again following welcome rains, fence must be fixed in order to utilize the forage. "They (the USFS) said they weren't going to do anything with the fences for a couple of years. But you have to have fence you can use. Every corner and gate post was wooden so of course a bunch of them burned," Gunn resurrected much of the ruined fence using a combination of old and new materials. The wire is already quite rusty, he said and likely will not last much longer. After contacting local fencing crews for estimates, Carroll and his business partner determined that new fence in that area was worth about $4 per foot. Carroll recalls seeing blowing topsoil on a good share of Gunn's pasture. "Some people lost an inch of topsoil and documented it. What's an acre of topsoil worth? If you had to find someone to truck it in, that is what the value is." Those are the types of expenses figured into the reports, along with sick or dead livestock, burned trees and structures, and lost forage, Carroll said. The ranchers and Carroll are disappointed in the ruling. "They (the federal government) have a history of settling these things one way or another. We hope there will be a reasonable settlement for the people involved," Carroll said. But a lawsuit against the feds is the only option for the claimants now. And Gunn is not optimistic. 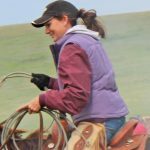 "A grazing district in Fort Pierre filed suit against the Forest Service about 15 years ago over policy issues and they spent about a million dollars on attorney fees. They said it was all lost money because for every attorney they had the government had 200." The Pautre fire and another out-of-control federal burn, known as the Cold Brook Fire that got away in Wind Cave National Park in the early spring of 2015, prompted Senator Thune to introduce legislation calling for reimbursement out of the current budget of the responsible agency for damages in cases such as these. 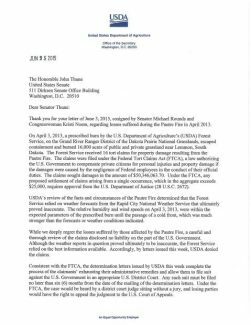 "I'm disappointed that the USDA has refused to acknowledge negligence and accept responsibility for the out-of-control Pautre fire that had such a devastating impact on property in northern South Dakota," said Thune in a news release. "USDA's denial leaves many South Dakota farmers and ranchers – who have already waited more than two years for a USDA decision – with the inability to have their claims resolved any time soon. We must prevent situations like these from occurring in the future, which is why I've introduced the Prescribed Burn Approval Act of 2015 that would require a federal agency to timely pay for losses that result from an out-of-control fire that it starts." Tempers remain hot over the fire itself. "Before the fire started, everyone was telling them 'don't burn,'" said Smith. Conditions were dry and weather reports called for wind. The Bismarck weather department had posted extreme dry conditions and advised no burning. "Locals were telling them, ranchers were telling them, the Bismarck weather department told them. The ranger came over to my place and said 'we are going to burn tomorrow.' I said 'absolutely not.' They burned anyway." Gunn said the forest rangers "asked some of the permittees what they thought about doing a controlled burn a day before it was scheduled. Johnny Johnson (a neighbor and permittee) said 'absolutely not. It is supposed to be hot." The objectives of the planned 130-acre fire, according to a USFS briefing paper were to blaze crested wheat grass in order to enhance wildlife and help prevent future wildfires, Smith said. "How can burning just over 100 acres in a 9,000 acre pasture have any effect on wildlife habitat or hazardous fuel?" Smith asks. "One year after, you couldn't tell what had burned or what hadn't burned. How will that affect wildlife?" questioned Smith. Babete Anderson said the USFS has not conducted any more prescribed burns on the Grand River National Grassland and has no plans to do so in the near future. Shawn S. McGruder with the U.S. Department of Agriculture Office of General Counsel sent the claimants the denial letters. She chose not to comment. The office of general counsel who packaged the claims and sent them to the national office did not respond to questions and the USFS national press officer apologized that he had nothing more to offer.